Next on our tour, the Bedrooms! The bedrooms in the Cottage weren’t in terrible shape. 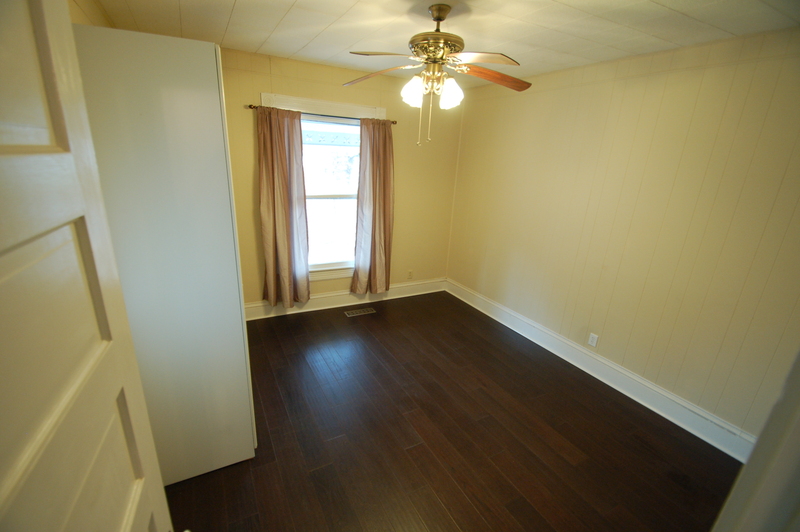 There are just two bedrooms in the house : one that’s a really great size, and the second that’s REALLY small. It’s more of an office. They were definitely run down, and tired. Beside size, the two were – and now still are – pretty identical. The bad : Awful carpet. Bad lighting. Dirty. Acoustical-like ceiling panels that I loathe. 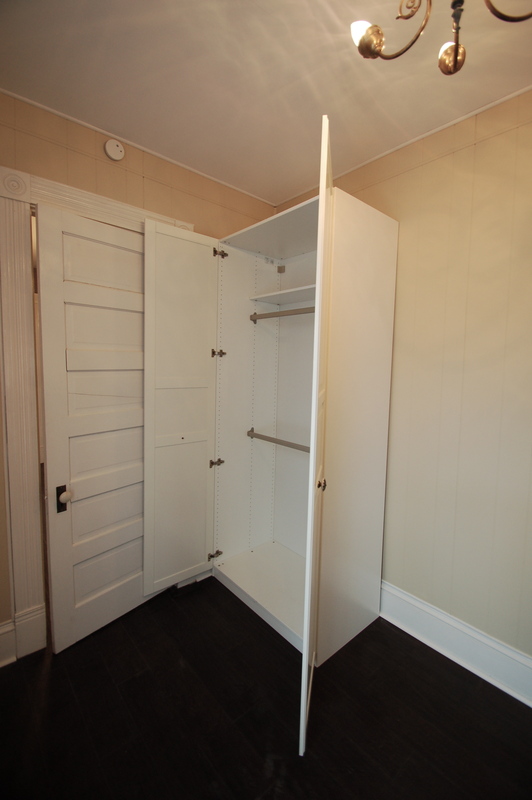 No closets or storage (typical in a house this age). 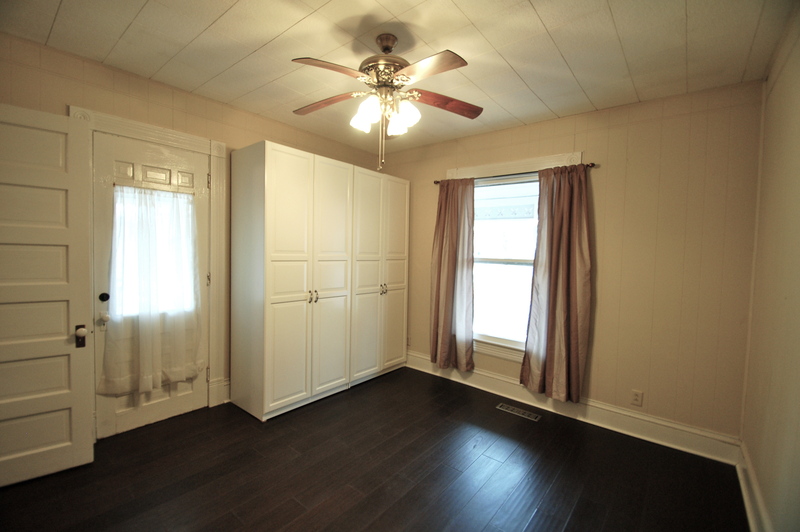 We never really got into a pattern of calling this the “Master Bedroom,” thought that’s what it is. 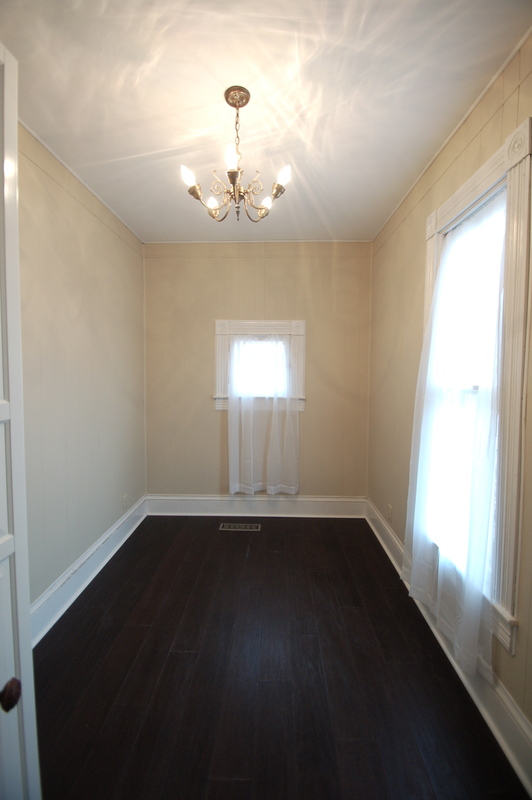 We call this the “Front Bedroom.” It’s about 12×14. The first thing we did was to evict the carpet. 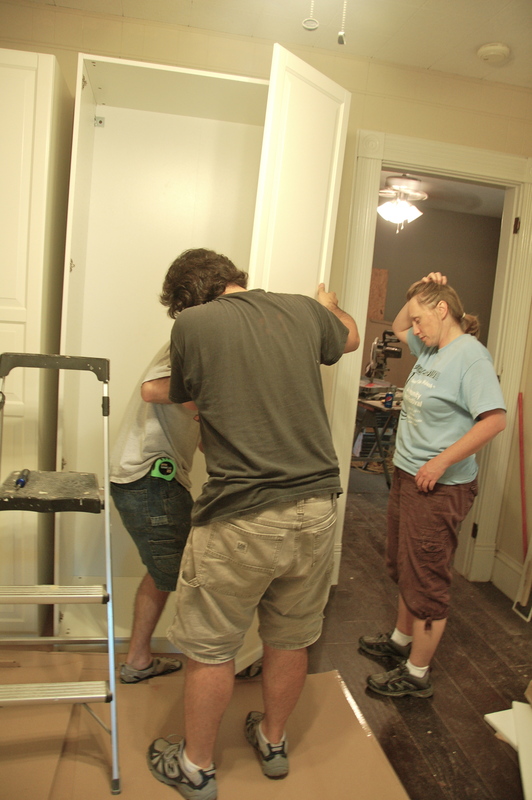 While we had hoped to save the floors in the entire house, they were too far gone to save. 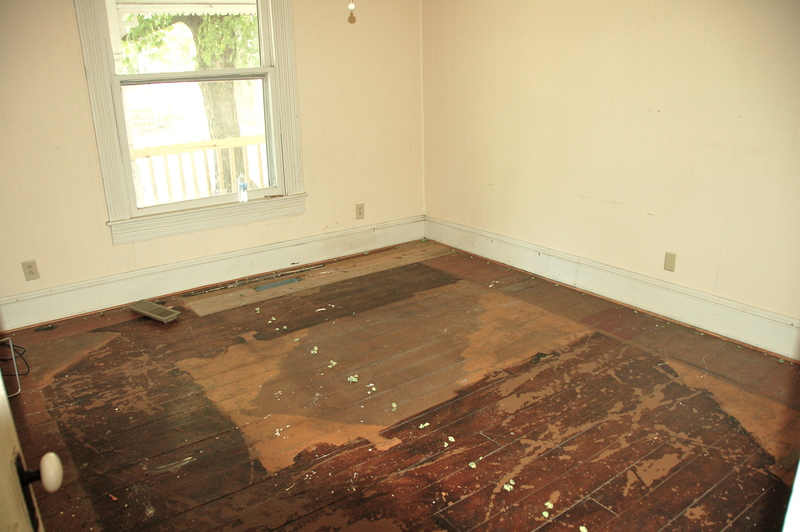 Both bedrooms had some serious areas of rot in the floors. 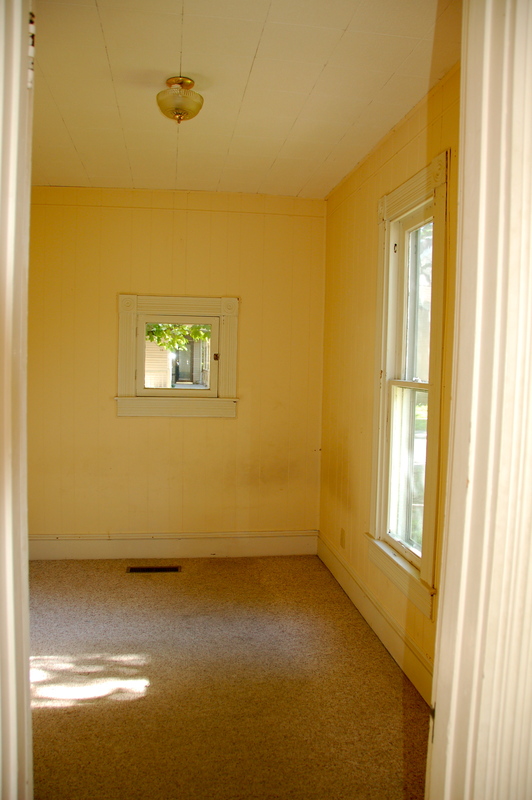 This room also has an exterior door, which is common in the area – I suspect a lot of these downtown homes were businesses at one time. 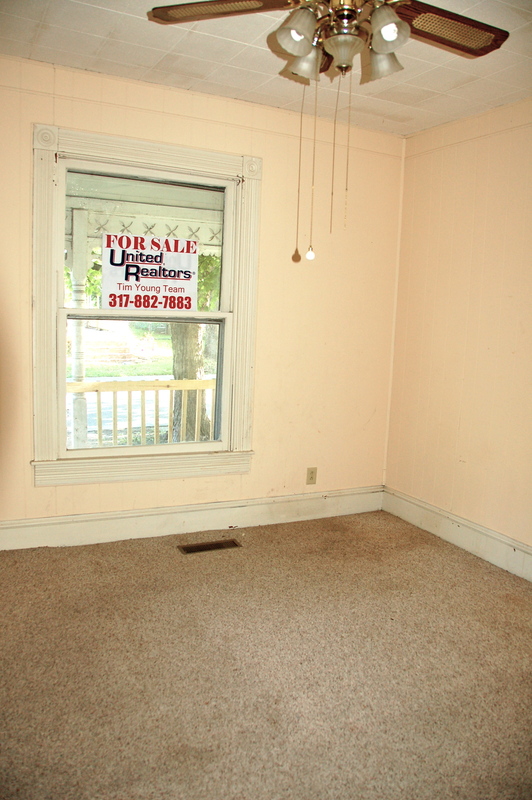 There’s no way this was a duplex, which is another reason to have two entrances. 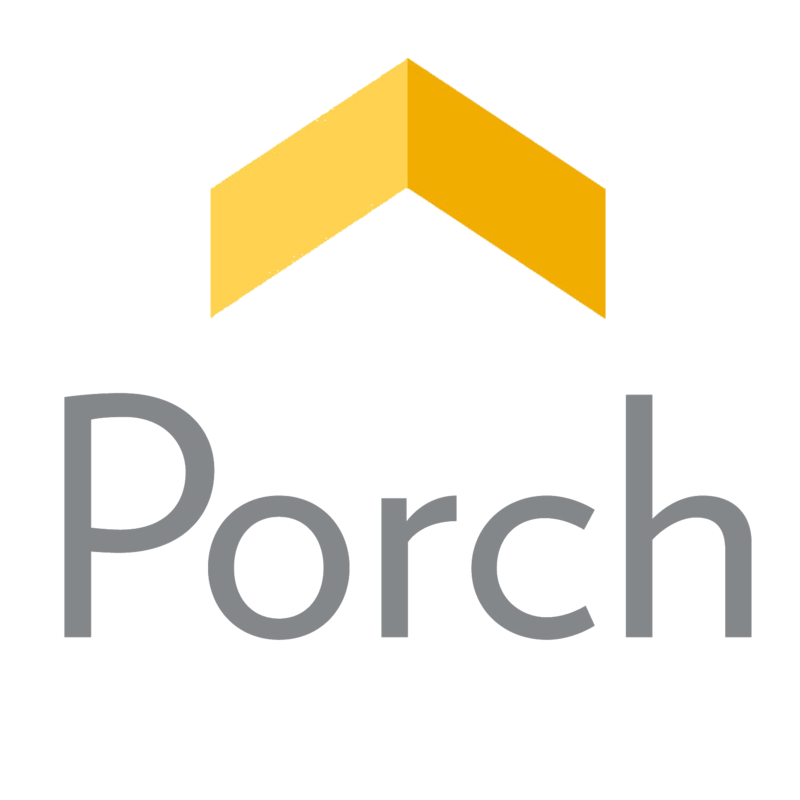 For a brief while while the front door of the house was boarded up, and the back door was boarded up as it was being replaced, this was our only entrance to the house. And it only worked with a skeleton key. Amazing! 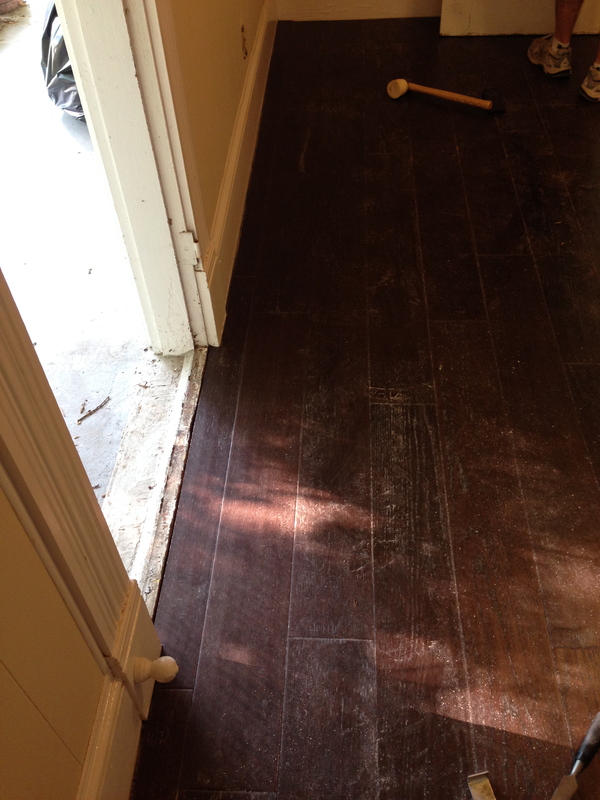 We replaced the floors, which made a huge – HUGE – difference. We went to IKEA and found some wardrobes for the bedrooms. I know what you’re thinking. IKEA? REALLY? Yup. 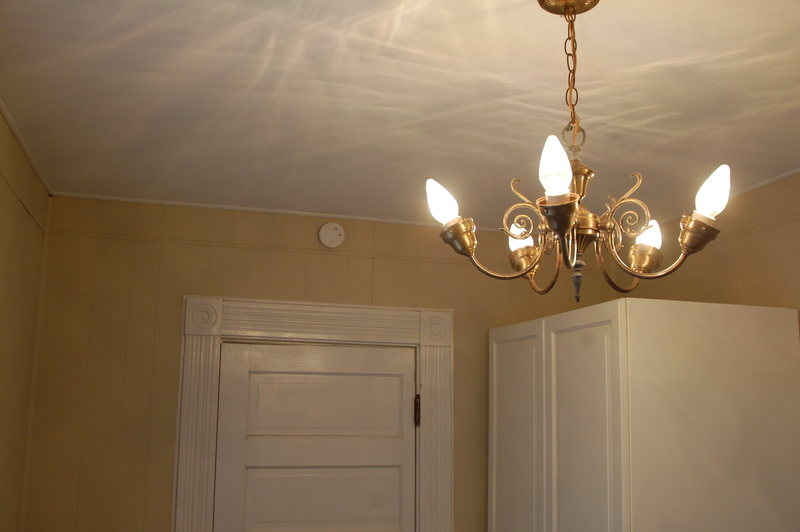 That was the hard thing with restoring this place – trying to stay historically accurate, but also being mindful that it is – in fact – a rental. 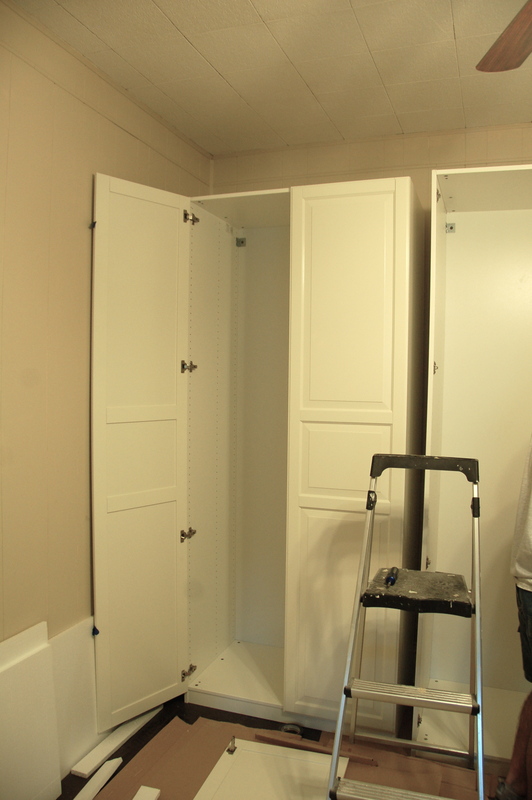 Building closets was out of the question – free-standing furniture was the only way to go. 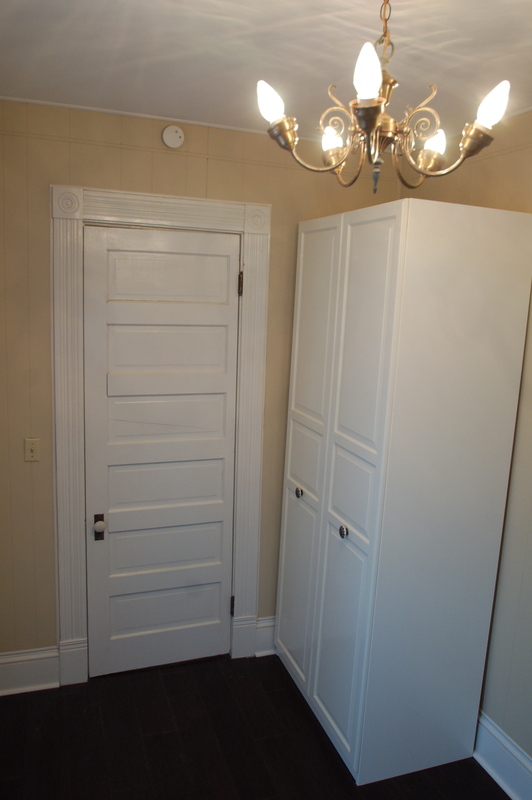 I didn’t want to put an antique piece in here, so we settled on some wardrobes form IKEA that have similar paneling to the doors throughout the house. Edgar built them all for us, and then we wrestled them into place. 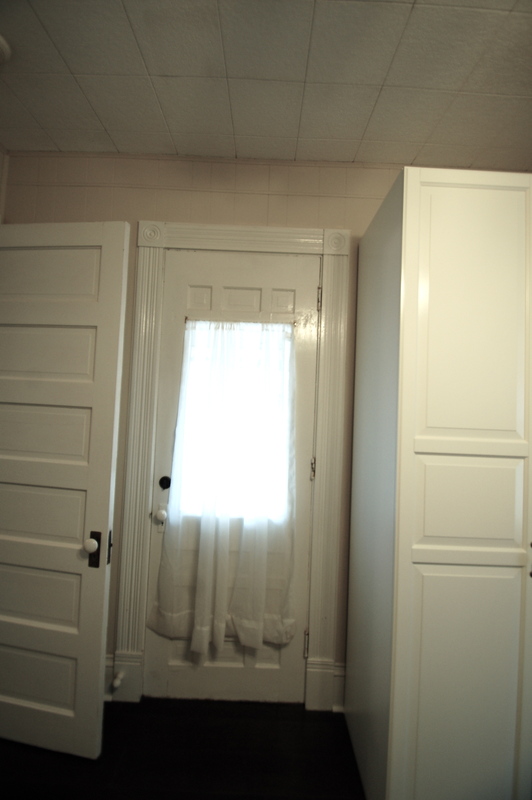 The front bedroom got two wardrobes. SO much storage. I chose to NOT use IKEA hardware, though. Sturdy and somewhat vintage was the name of the game here. 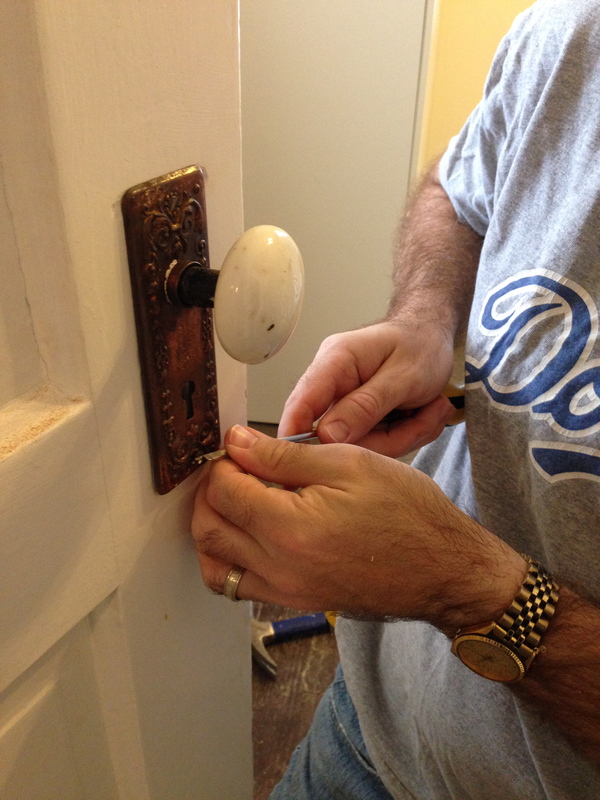 And I wanted it to at least mimic the door hardware a bit. 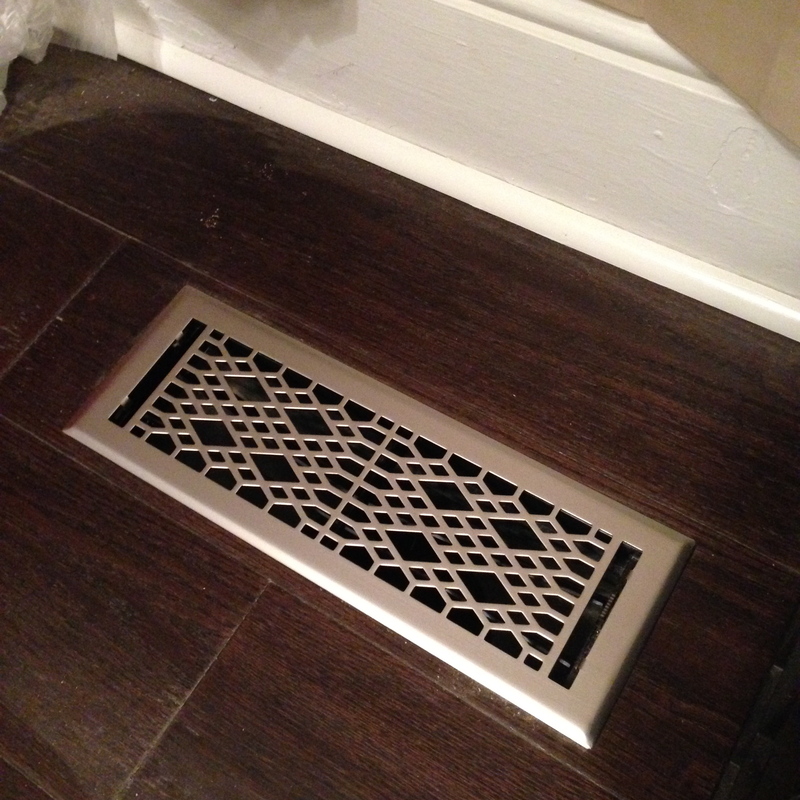 Small details like the vent covers are important to me as well. 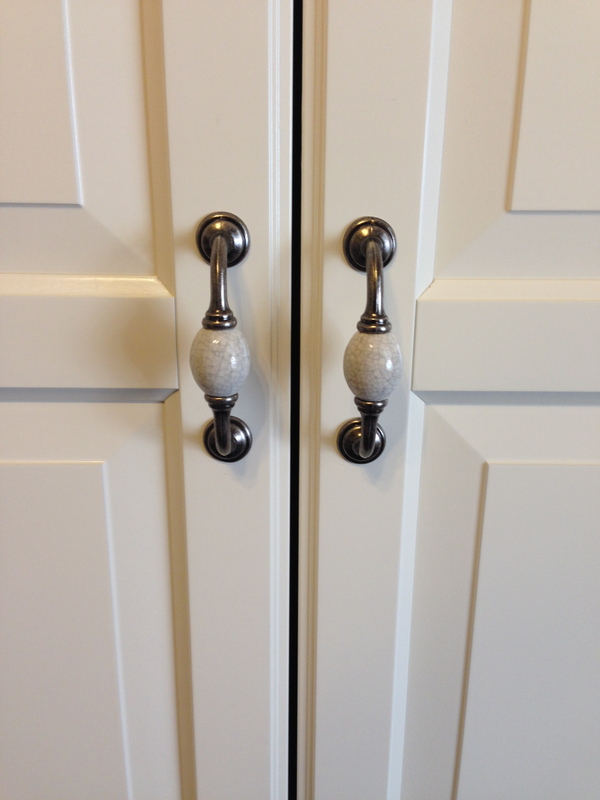 I used these in the bedrooms and the Living Room and Dining Rooms. 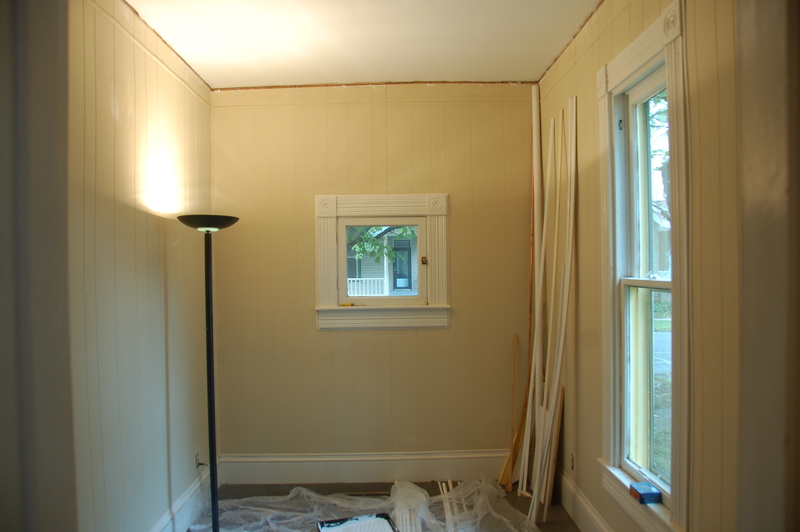 We repainted the walls and the woodwork, and now it’s lovely. 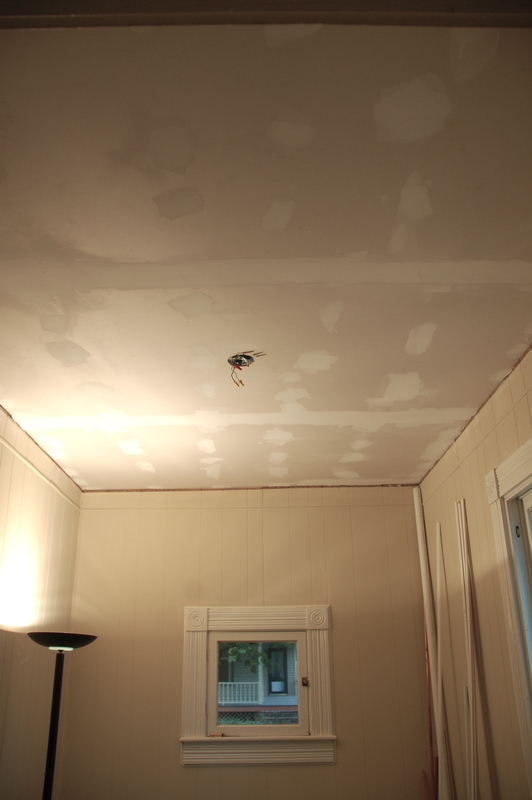 On the “To Do” list in the future, is to replace the ceiling, because I hate it. But it just wasn’t in the cards with the time and the money that we had here. 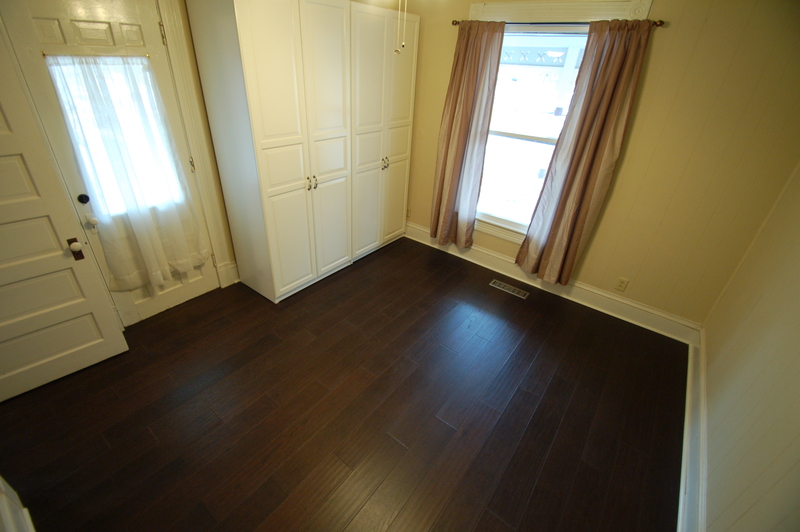 Those floors…. such a difference. Here’s the back bedroom. It’s about 7×12, and has beautiful light. It’s really a sweet little room. 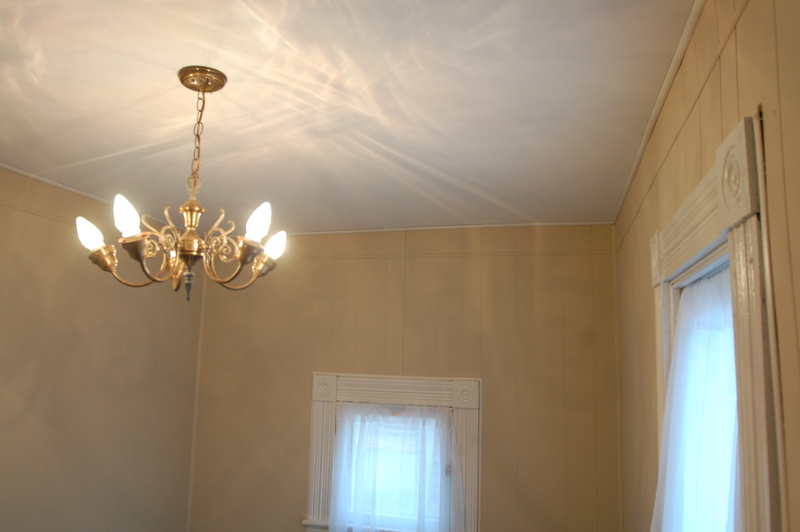 The back bedrooms went through the same restoration as the front bedroom, with one exception. 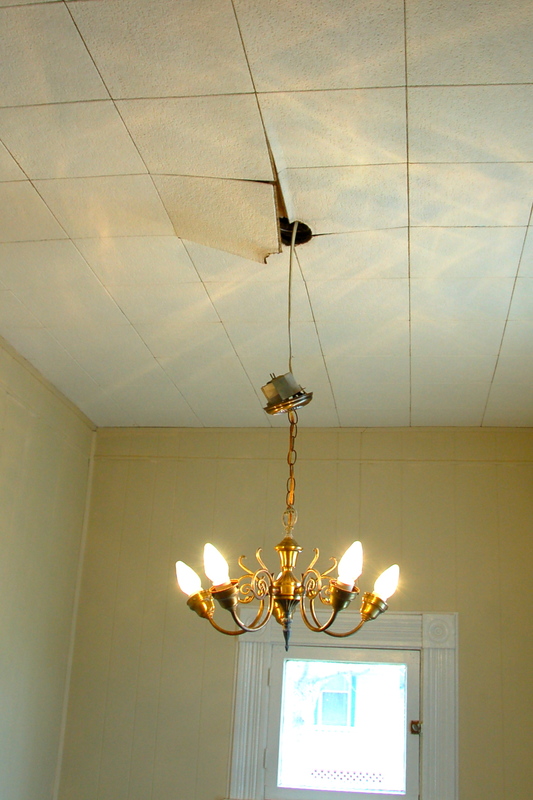 When the flood happened, the ceiling collapsed, so it had to be replaced. This – truly – was the best thing to come out of that flood. Except for finding the shoe. 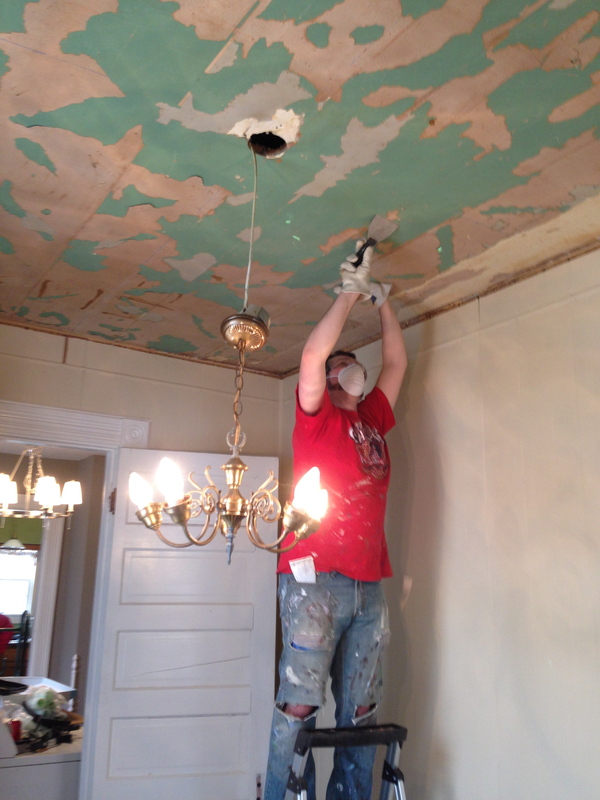 On our post-flood workday, Jordan and Stephen ripped the ceiling down, and found this amazing patina, which we then covered up. I still maintain that if this was a house I was living in, I would have clear-coated this and let it shine. New drywall went up, and it was painted. We put one wardrobe in this room. It eats up space, but I think it’s worth it. I can kind of pretend that those doors go together, right? 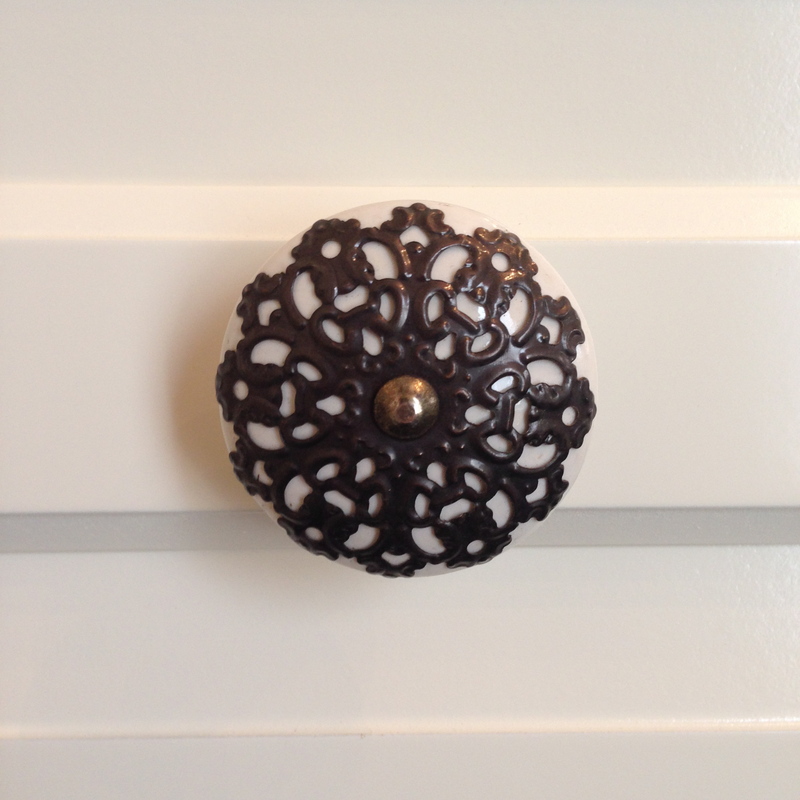 On the wardrobe doors, I chose a different knob than the front bedroom. This is ceramic with a copper overlay. 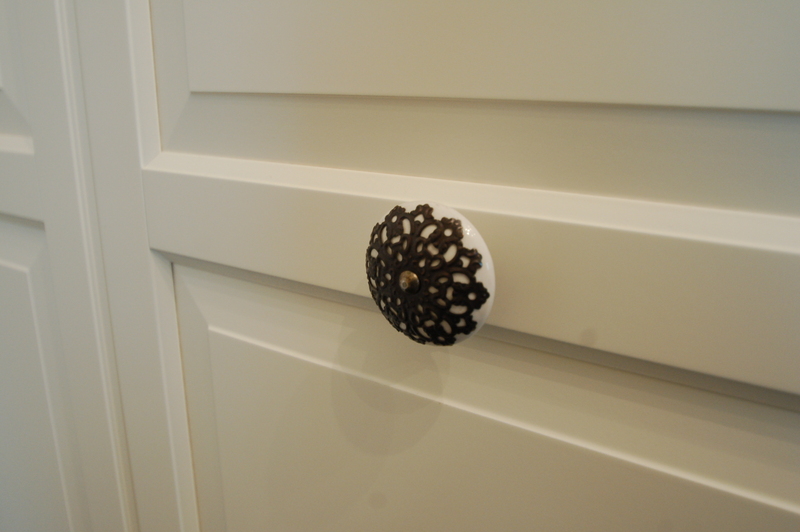 The inside doorknob to the room is ceramic with a copper backplate. So they play well together! 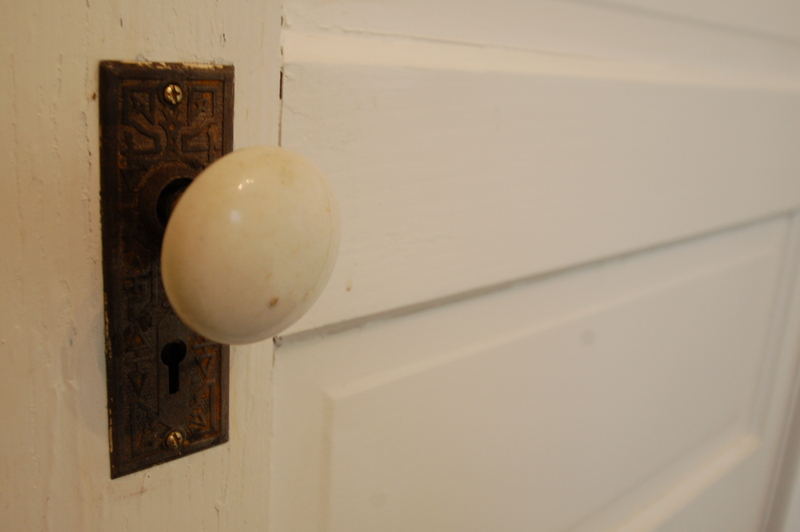 The dining room side of the door has this gorgeous doorknob. It’s so pretty. It works. Special little room. 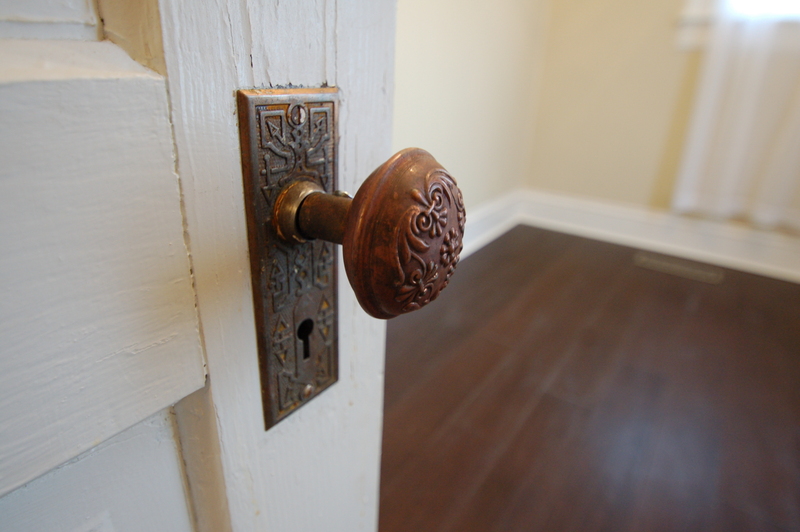 It’s hard for me to paint rooms beige, but I know it’s a good rental color. 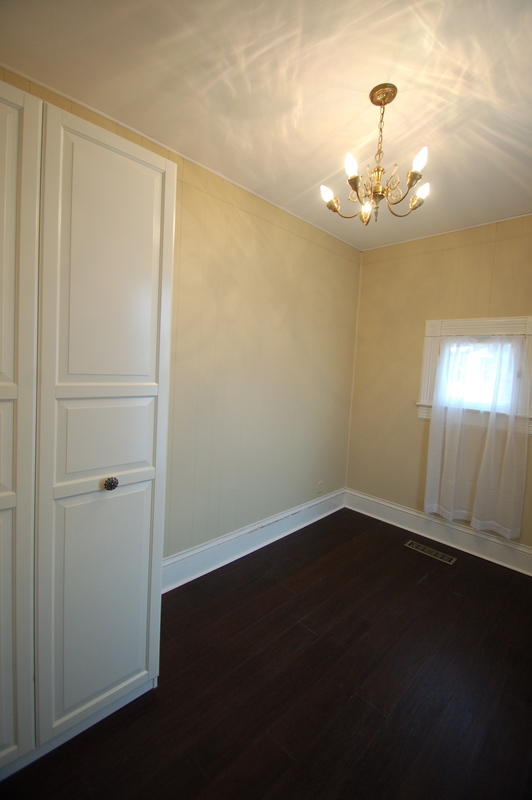 Both bedrooms share the same paint color, despite how it might look in my not-always-great photographs. There they are! A few changes made such a big difference, if for no other reason then it now looks clean. 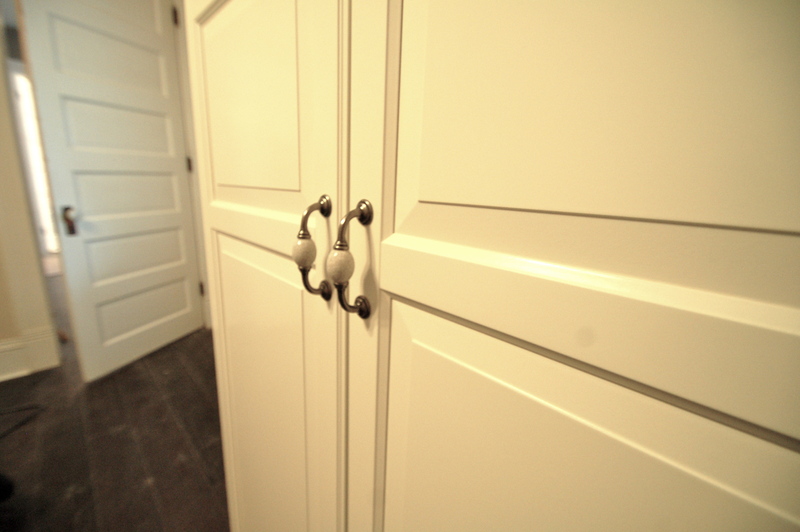 If you’ve missed the rest of the reveal, make sure you check out the exterior and the bathroom. 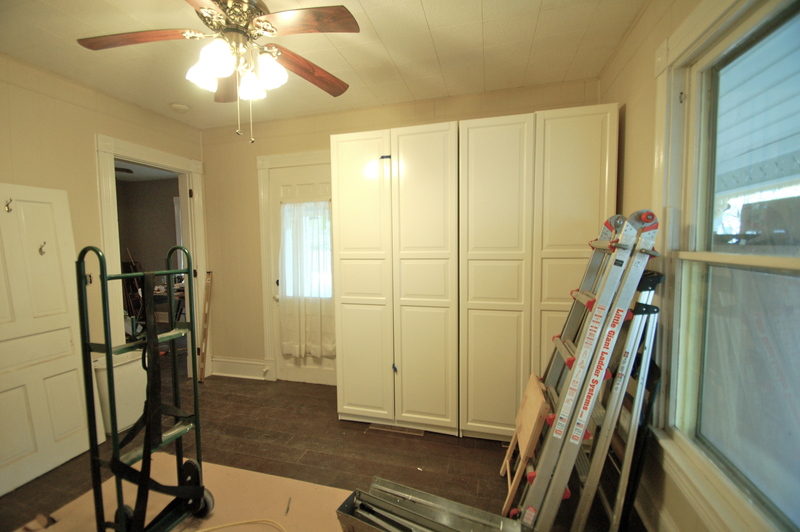 The kitchen and utility room are coming up next! Previous PostThe Cottage is Complete. Love, and a Look Back.